Leaders of Tomorrow Symposium features 'Hotel Impossible' producer-host | Command and General Staff College Foundation, Inc. 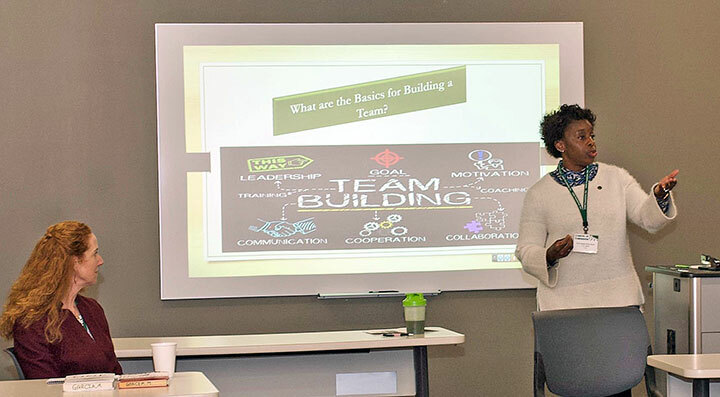 The CGSC Foundation, in conjunction with Park University, hosted the Leaders of Tomorrow symposium on March 29, at the Park University campus. Former KC Mayor Kay Barnes delivers the morning keynote at the 2019 Leaders of Tomorrow symposium at Park University. CGSC faculty members Lt. Col. (Ret.) Sandra Ming-Doyle (standing, right) and Lt. Col. (Ret.) Michelle Garcia, lead the “Teamwork” breakout session. 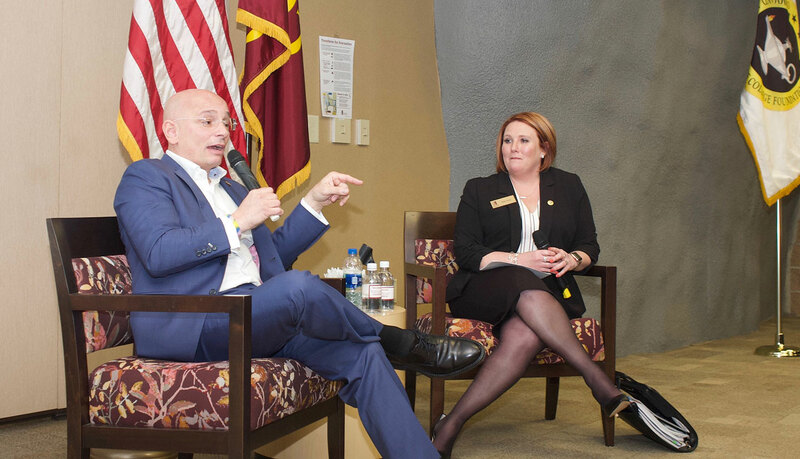 Anthony Melchiorri, host, co-creator and co-executive producer of Travel Channel’s “Hotel Impossible” series of shows, speaks with Katie Ervin, Park University’s associate vice president for academic operations and secretary of the CGSC Foundation board of trustees, in a “fireside chat” during the Leaders of Tomorrow symposium March 29 at Park University. The event included two keynote speakers: Kay Barnes, former mayor of Kansas City, Mo. 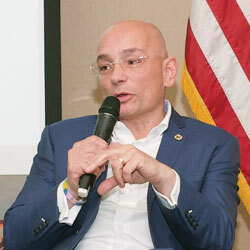 (1999-2007) and current senior director for university engagement at Park University; and Anthony Melchiorri, host, co-creator and co-executive producer of Travel Channel’s “Hotel Impossible” series of shows. Melchiorri is a 1990 Park graduate and a member of its board of trustees. Park University President Dr. Greg Gunderson and CGSC Foundation Vice Chairman Lt. Gen. (Ret.) Richard Keller welcomed attendees with short remarks at the outset of the symposium followed by morning keynote speaker Mayor Barnes. After the breakout sessions, the participants gathered in the main room for lunch and to hear remarks from Melchiorri, who spoke in a fireside chat format with Katie Ervin, Park University’s associate vice president for academic operations and secretary of the CGSC Foundation board of trustees. The “Leaders of Tomorrow” symposium is one of the CGSC Foundation’s leader development programs which are intended for leaders who ASPIRE to learn and grow, INSPIRE them to further develop themselves and others, and help them MASTER the skills necessary to be better leaders. “AIM” is the guiding principle for these programs. 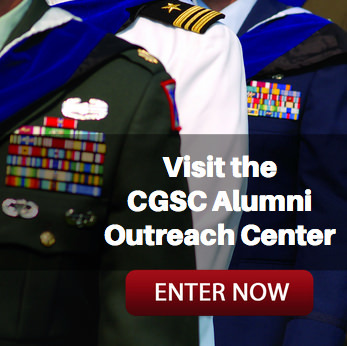 Contact the CGSC Foundation for more information on these and other programs. 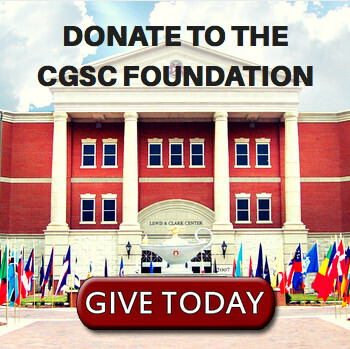 Visit the CGSC Foundation album on Flickr for more photos from the symposium.